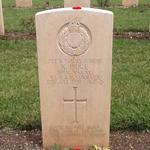 Private James Rudman is reported as dying on active service Hong Kong. His name is also recorded here Winchester Reunion of No 1 Commando . This entry in the event programme lists his name under " Died whilst on active service in the Far Eastern theatre of operations."